The New Zealand Falcon Falco novaeseelandiae or – Karearea (Moari name) – is an endangered bird species that is only found in New Zealand. 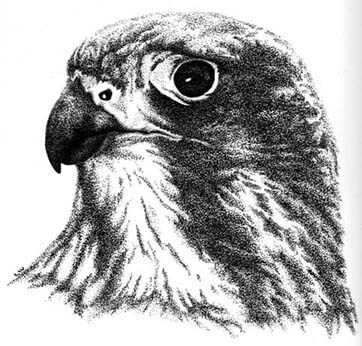 Falcons for Grapes is a program that has been established in some vineyards where a pair of New Zealand Falcons is introduced into a vineyard to reduce the damage to the grape crops caused by pest birds. The New Zealand Falcon is a fearsome hunter. Whilst in New Zealand recently we visited Wingspan and saw them up close. Basically every bird in the area went into hiding when the falcon came out to fly! Just a tip about Rotring pens – I was given a lovely set of them but they were not working – after hours with hot water and then methylated spirits was unsucessful , the tutor mentioned cleaning off mistakes from the drafting film that she uses with ‘windex’ – I thought what have I got to lose. Soaked the nibs overnight in some windex and they are all now working perfectly! Never thought of using Windex. That’s an excellent tip. I’ve got a stack of ink-crusted Rotring pens around the place. Seems such a waste to have them lying around doing nothing.